Sol est fons solaris telluris electricitatis. Domus Solaris #1, apud Institutum Technologiae Massachusettense anno 1939 aedificata. Cratera parabolica vaporem coquendi Auroville Indiae efficit. 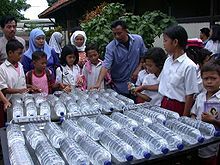 Disinfectio aqua solari effecta in Indonesia. Caldaria in Westlandia, municipio Nederlandico, holera, fructus, floresque producunt. Coacervatio energiae thermalis: statio electricitatis solaris ad Andasol lacus salis liquefacti ad energiam solarem coacervandam adhibet. Participes in officina de progressu qui sustineri potest laminas solares in Monterrey Institute of Technology and Higher Education Mexicopoli in tecto aedificii in campo universitario inspiciunt. Energia solaris est lux et calor e sole radiantes, qui per technologias evolventis sicut calorificatio solaris, photovoltaica, energia thermalis solaris, architectura solaris, officinae electricitatis salsae, et photosynthesis artificiosa extrahuntur et continentur; quae energia est fons energiae renovabilis magni momenti, et eius technologiae aut solarem passivam aut solarem activam late describuntur, secundum modum per quem energiam solarem capiant atque in electricitatem solarem distribuant. Inter activas artes solares sunt ratio photovoltaica, electricitas solaris contracta, et calorificatio aquae solaris ad energiam continendam. Inter passivas artes solares sunt orientatio aedificiorum ad solem, selectiio materiarum quibus est massa thermalis vel proprietates quae lucem dissipant, et designatio spatiorum quae aerem naturaliter movent. Agrafiotis, C., et. al. 2005. Solar water splitting for hydrogen production with monolithic reactors. Solar Energy 79 (4):409–421. Bibcode:2005SoEn...79..409A. doi:10.1016/j.solener.2005.02.026. Anderson, Lorraine, et Rick Palkovic. 1994. Cooking with Sunshine: The Complete Guide to Solar Cuisine with 150 Easy Sun-Cooked Recipes. Marlowe & Company. ISBN 1-56924-300-X. Balcomb, J. Douglas. 1992. Passive Solar Buildings. Cantabrigiae Massachusettae: Massachusetts Institute of Technology. ISBN 0-262-02341-5. Bartlett, Robert. 1998. Solution Mining: Leaching and Fluid Recovery of Materials. Routledge. ISBN 90-5699-633-9. Bénard, C., D. Gobin, et M. Gutierrez. 1981. Experimental Results of a Latent-Heat Solar-Roof, Used for Breeding Chickens. Solar Energy 26(4):347–359. Bibcode:1981SoEn...26..347B. doi:10.1016/0038-092X(81)90181-X. Bolton, James. 1977. Solar Power and Fuels. Academic Press. ISBN 0-12-112350-2. Bradford, Travis. 2006. Solar Revolution: The Economic Transformation of the Global Energy Industry. Cantabrigiae Massachusettae: MIT Press. ISBN 0-262-02604-X. Butti, Ken, et John Perlin. 1981. A Golden Thread: 2500 Years of Solar Architecture and Technology. Van Nostrand Reinhold. ISBN 0-442-24005-8. Carr, Donald E. 1976. Energy & the Earth Machine. Novi Eboraci: W. W. Norton & Co. ISBN 0-393-06407-7. Daniels, Farrington. 1964. Direct Use of the Sun's Energy. Ballantine Books. ISBN 0-345-25938-6. Denzer, Anthony. 2013. The Solar House: Pioneering Sustainable Design. Rizzoli. ISBN 978-0847840052. Halacy, Daniel. 1973. The Coming Age of Solar Energy. Harper and Row. ISBN 0380002337. Hunt, V. Daniel. 1979. Energy Dictionary. Van Nostrand Reinhold Co. ISBN 0-442-27395-9. Karan, Kaul; et. al. 2001. Row Orientation Affects Fruit Yield in Field-Grown Okra. Journal of Sustainable Agriculture 17 (2/3): 169–174. doi:10.1300/J064v17n02_14. Leon, M., et S. Kumar. 2007. Mathematical modeling and thermal performance analysis of unglazed transpired solar collectors. Solar Energy 81(1):62–75. Bibcode:2007SoEn...81...62L. doi:10.1016/j.solener.2006.06.017. Lieth, Helmut, et Robert Whittaker. 1975. Primary Productivity of the Biosphere. Springer-Verlag. ISBN 0-387-07083-4. Martin, Christopher L., et D. Yogi Goswami. 2005. Solar Energy Pocket Reference. International Solar Energy Society. ISBN 0-9771282-0-2. Mazria, Edward. 1979. 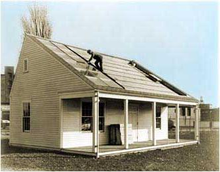 The Passive Solar Energy Book. Rondale Press. ISBN 0-87857-238-4. Meier, Anton, et al. 2005. Solar chemical reactor technology for industrial production of lime. Solar Energy 80(10):1355–1362. Bibcode:2006SoEn...80.1355M. doi:10.1016/j.solener.2005.05.017. Mills, David. 2004. Advances in solar thermal electricity technology. Solar Energy 76(1-3):19–31. Bibcode:2004SoEn...76...19M. doi:10.1016/S0038-092X(03)00102-6. Müller, Reto, et A. Steinfeld. 2007. Band-approximated radiative heat transfer analysis of a solar chemical reactor for the thermal dissociation of zinc oxide. Solar Energy 81(10):1285–1294. Bibcode:2007SoEn...81.1285M. doi:10.1016/j.solener.2006.12.006. Perlin, John. 1999. From Space to Earth: The Story of Solar Electricity. Cantabrigiae Massachusettae: Harvard University Press. ISBN 0-674-01013-2. Scheer, Hermann. 2002. The Solar Economy: Renewable Energy for a Sustainable Global Future. Earthscan Publications. ISBN 1-84407-075-1. Schittich, Christian. 2003. Solar Architecture: Strategies Visions Concepts. Architektur-Dokumentation GmbH & Co. KG. ISBN 3-7643-0747-1. Smil, Vaclav. 1991. General Energetics: Energy in the Biosphere and Civilization. Wiley. ISBN 0-471-62905-7. Smil, Vaclav. 2003. Energy at the Crossroads: Global Perspectives and Uncertainties. Cantabrigiae Massachusettae: MIT Press. p. 443. ISBN 0-262-19492-9. Smil, Vaclav. 2006. Energy at the Crossroads. Organisation for Economic Co-operation and Development. ISBN 0-262-19492-9. Tabor, H. Z., et B. Doron. 1990. The Beith Ha'Arava 5 MW(e) Solar Pond Power Plant (SPPP)--Progress Report. Solar Energy 45(4):247–253. Bibcode:1990SoEn...45..247T. doi:10.1016/0038-092X(90)90093-R.
Tiwari, G. N., H. N. Singh, et R. Tripathi, R. 2003. Present status of solar distillation. Solar Energy 75(5):367–373. Bibcode:2003SoEn...75..367T. doi:10.1016/j.solener.2003.07.005. Tritt, T., H. Böttner, et L. Chen. 2008. Thermoelectrics: Direct Solar Thermal Energy Conversion. MRS Bulletin 33(4):355–372. Tzempelikos, Athanassios, et Andreas K. Athienitis. 2007. The impact of shading design and control on building cooling and lighting demand. Solar Energy 81(3):369–382. Bibcode:2007SoEn...81..369T. doi:10.1016/j.solener.2006.06.015. Vecchia, A., et al. 1981. Possibilities for the Application of Solar Energy in the European Community Agriculture. Solar Energy 26(6):479–489. Bibcode:1981SoEn...26..479D. doi:10.1016/0038-092X(81)90158-4. Yergin, Daniel. 1991. The Prize: The Epic Quest for Oil, Money, and Power. Simon & Schuster. ISBN 0-671-79932-0. Zedtwitz, P. V., et al. 2006. Hydrogen production via the solar thermal decarbonization of fossil fuels. Solar Energy 80(10):1333–7. Bibcode:2006SoEn...80.1333Z. doi:10.1016/j.solener.2005.06.007. Vicimedia Communia plura habent quae ad energiam solarem spectant. Fontes interretiales. American Solar Energy Society. Novissima mutatio die 1 Iunii 2018 hora 14:20 facta.